The arrest of a leading opposition figure in Bangladesh is a stark reminder that without due legal process, examining the wrongs of the past can quickly become an opportunity for political leverage in the present. A version of this article first appeared on Opendemocracy.net. My earliest memories of my grandfather is of him walking in a simple white vest and lunghi (a traditional Bangladeshi clothing) tending to the garden he cherished that surrounded his modest tin-roofed home in Dhaka. A lover of nature and a simple and deeply spiritual man with no desire for the financial eminence many seek, humility and simplicity was his nature. It was always astounding to his visitors who expected opulence of such a leading national figure. Along with this was a gentleness and generosity that made each of his numerous grandchildren feel uniquely beloved and special. On January 11, I watched aghast as my 89 year old grandfather, Professor Ghulam Azam, was taken away by the authorities to prison. 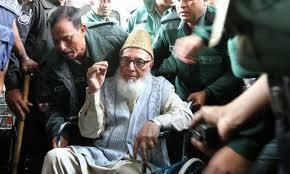 He was arrested on 62 trumped up charges of war crimes during the 1971 Bangladesh independence war, including the quite ludicrous charge of responsibility, “for all atrocities committed across the country between March 25, 1971, and December 16, 1971”. During the war my grandfather was the political leader of what was simultaneously the largest religious group in the then East Pakistan, but a small political party with little clout in the wider political arena at the time. He supported the unity of East and West Pakistan, however he remained absolutely opposed to the military aggression on the ground, including the crimes committed by both military and paramilitary forces, and worked tirelessly to help aid those caught in the cross-fire. Nevertheless, despite his desperate attempts at reconciliation at the time, he was made a scapegoat for crimes committed by both the Pakistani military and paramilitary forces. A deeply patriotic man and a leading activist for the nation’s historic Bengali Language Movement, he has been the victim of a sustained and virulent media smear campaign that has demonised his character, leading many, including those born after the war, to misjudge a man they have never met. Now, the party my grandfather built is one of the leading opposition groups in Bangladesh and allied with another major opposition group represents a genuine political threat to the ruling Awami League led regime. The ruling party is conducting a crippling political witch hunt of the opposition in the name of seeking justice for victims of war crimes. The International Crimes Tribunal (ICT) bears no signs of the international standards it lays claim to. Senior political figures condemn those who merely support the accused as worthy of arrest and the chairman of the ICT himself has considerable bias in the case, in the 90’s having been a member of an illegal ‘Public Enquiry Commission’ that was conducted outside any legal framework and that found my grandfather guilty. In addition, while leading members of the opposition party have been arrested and endured almost two years of pre-trial detention and torture without charge, pro-liberation fighters, many of whom are part of the ruling party, are exempt from any charge or trial. Thus war crimes committed by the latter, such as those against the Bihari communities, face blatant disregard. Many, from journalists to international lawyers, have strongly critiqued the glaring legal flaws in the tribunal, including its flawed procedure and apparent desire to enact revenge rather than justice. Even the United Nations condemned the arrests of suspects as arbitrary and in contravention of human rights. Before an international court, such as The Hague, that is observant of due process and guarantees fair treatment, our family would have no qualms about the case. Indeed, we are in no way opposed to the holding of a tribunal; our only demand is that it be impartial and fair. However, any attempt to address these issues is sharply and passionately denounced as a conspiracy to undermine the tribunal. This is reflective of a wider shift in Bangladesh. Freedom of speech is regularly curtailed, a fact even the staunchest supporters of the government cannot deny: any critic of the tribunal or government is swiftly punished. Charges of sedition over the expression of political views betray a telling rise of censorship in the country. In its desperation to keep afloat a tribunal which any legal scrutiny would swiftly sink, the ire of the government does not even spare senior foreigners critical of the system: Toby Cadman, a British barrister with expertise in international human rights and war crimes, was refused entry to the country and vilified for his constructively critical comments. At a hearing on January 9, my grandfather’s barrister was informed that he must present his client in court on January 11 or my grandfather would face arrest. However, upon appearing in court he was arrested regardless. In spite of showing no signs of departure or avoidance throughout the smear campaign that has gained momentum over the past two years, it would appear the authorities still deemed an 89 year old man incapable of walking without support to be a flight risk. Bail was sought due to his old age and poor health: though granted at first it was swiftly revoked. Pro-regime news outlets across the country went wild spewing unverified polemic: judgement was passed in the media even before he could be judged before a court. The leftists in the ruling party are a particularly emphatic force in the campaign against my grandfather. As a student activist in Britain, for years I worked with western socialists who proved the backbone for international movements for human rights and justice. However, the Bangladeshi left demanding the hangman’s noose rather than a fair trial as the just resolution to wartime suffering, leaves me bewildered at the brand of socialism these individuals practice. The government’s apparent desire for justice over the events of the 1971 war becomes particularly questionable when reflecting on the many serious cases of violent criminality the country has suffered recently that remain tellingly disregarded. A simple and glaring example lies in the 2009 siege at the Headquarters of the border security force, Bangladesh Rifles (BDR). Scores of leading army officers were brutally killed, their wives raped and murdered. Like the infamous murder of the intelligentsia at the close of the 1971 war, the loss of army majors and brigadier generals, superior officers trained over decades, is another deeply dark and tragic space in Bangladesh’s history. Yet, the event remains unresolved, the reaction to it muted and the legal procedures questionable. Small scale and subdued tribunals are slowly under way in makeshift courts, a damningly inadequate response to such a heinous offence against the nation. Those bereaved officers who questioned and criticised Prime Minister Sheikh Hasina over the siege were swiftly discharged from the army. While neglecting the crisis of the present, the authorities have sought to exact political gains by resurrecting and manipulating an event from the past, indeed one which Sheikh Mujibur Rahman, the founding father of Bangladesh and father of Sheikh Hasina, had already resolved soon after the nation’s independence. Police brutality and death in custody is commonplace in Bangladesh and harassment of the ICT defence has been recorded by Human Rights Watch, among others. Bangladesh also remains the only nation that not only practices execution but has in recent times expanded its use. Add to that an extended vitriolic campaign, involving shockingly graphic posters calling for punishment and execution festooned across the country’s major cities, and the results of the tribunal seem to be a foregone conclusion. The danger of injustice and mistreatment is all too real, and deeply worrying. Our last visit, before my recent return from Bangladesh, was limited to a paltry half hour with the four of us observed by eleven standing security personnel and several CCTV cameras. My grandfather was laid across the prison bed, physically weaker than I have ever seen him to be, yet encouragement emanating from his eyes and softly spoken words. I tearfully watched my grandmother weep as my grandfather kissed her fingers with the tenderness of one more aware of his beloved wife’s suffering than his own. I was reminded of his last message before arrest, calling on his followers to prioritise the protection of the nation and its people over any concern for him and to obey the law. It is a testament to his courage in the face of adversity, his devotion to his country and his spiritual strength while the rest of us quail. My grandfather has always been a frank and honest man, trusting God and fearing none besides. He has remained steadfast by his ideals and his hopes for his country and its people, dedicating his life to these causes in a way I have never witnessed from any other person. As I witnessed his unchanged spirit in his prison cell, I realised that a man of integrity cannot be conquered. A.Azam is the grandchild of Professor Ghulam Azam and a writer based in Britain. By sdcuk in Uncategorized on February 8, 2012 .